An exhibition of prints from my Artists Book ‘Carpet Pages‘ will take place at the Sayle Gallery, 11th March–3rd April. On the face of it nothing could be further from my earlier depictions of the Manx landscape than these collage and print explorations. However the attention to detail and texture is still very much apparent, so too are the finely tuned compositional elements and jewel like colours of my previous work. The title references the intricately constructed and beautifully decorated carpet pages found in illuminated manuscripts. These pages contain little or no text. An intense all over patterning fills the entire space combining imagery with colour. The colour ranges from fully saturated bold areas to finely rendered subtle shading. The embellishment of gold leaf gilding is often incorporated. Carpet pages are intentionally an intoxicating experience for the viewer. Although this artistic expression is new for me, a clear parallel can be drawn between the illuminated manuscript carpet pages and another medieval artistic medium which I have previously used – stained glass. My stained glass pieces shared a similar use of colour within bold graphic designs. 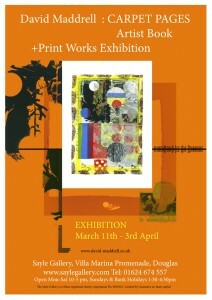 This exhibition could be seen as a radical departure from my more usual landscape work and in many ways that is true. However this is less a departure than an excursion which will lead to a refreshed approach to my more traditional land and seascape subjects. The carpet page structure and patterning evolved through my working process. A rich layered tapestry emerged evoking the memory of traditional carpet pages, though here the imagery is childlike and playful. Overall a positive, optimistic light prevails but this is at times interwoven with dark passages familiar to all lovers of folk lore and fairy tales. These highly embellished pages are bound into a hand stitched book using traditional book binding methods. To create the book I combined many different painting and printing techniques including screen printing, collage, rubber stamping and stenciling. The ‘Carpet Pages’ book will be on display while the main body of the exhibition consists of framed images, each a double page spread from the book. These are available as limited edition prints. A soundtrack directly inspired by the art work has been created by local musician Buggane of Ballagroove Records. Visitors to the exhibition will have the opportunity to listen to this kindred work whilst viewing the carpet page prints. A CD of the Carpet Pages soundtrack entitled ‘Buggane’s Cronnane’ will be released through Ballagroove Records. The initial release will have Carpet Page cover artwork and will be a limited edition run of 100 copies. You are currently browsing the David Maddrell weblog archives for February, 2011.